My third book read for the Guardian UK Challenge was Behind the Scenes at the Museum by Kate Atkinson. Now, I've long been a fan of her mystery series that began with Case Histories , so I was very excited to read this book, her first novel. Kate Atkinson is the mistress of gentle black humor, non-linear storytelling, and the last-minute reveal - elements that are indeed present in this first book, giving me a sense of how she has honed these skills over the years. Our protagonist is Ruby Lennox, narrating her story (and that of her family's) from the moment of her conception in York, England in 1951. The chapters narrated by Ruby are interspersed with "footnote" chapters that show us family history that occurred pre-Ruby. I found this book to be breathtaking in places and mostly darkly hilarious throughout (although, like any Atkinson book, it draws a tear from me from time to time). Atkinson has also clearly researched what English life was like for the lower-middle class during the First and Second World Wars. An excellent read, I give it 4 stars out of 5. There's a reason this book is considered a dystopian classic. It's a chilling diary of a future society in which women are valued only for their reproductive capacity, and are no longer allowed to read or own property. 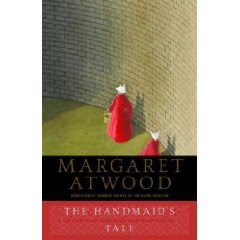 The book is narrated by "Offred" (Of + Fred, the new name given to her when she is placed in the household of a Commander named "Fred"), a handmaiden attached to the household of an elite. Offred struggles with her memories of life before the new regime, with her fears for her husband and her daughter, and with her fears for herself, should she fail to conceive a child with the commander. A brilliant and amazing book - I am only surprised that I never read it before. Next up: Behind the Scenes at the Museum by Kate Atkinson.